In seven days we will celebrate the anniversary of the Lord's first coming into the world. Keep working to better yourself. Know what is of value in your life. Thankyou for sharing this beautiful holy card! I wonder what kind of hat is that, laying on top of what looks like a shepherd's staff. Is that a shepherd's hat? 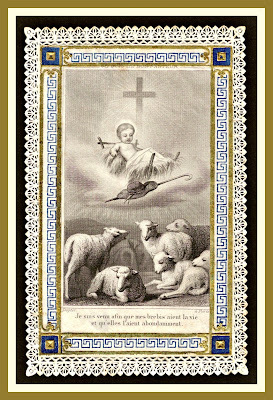 beautiful, that Jesus is hovering over the lambs. And thank you, Micki, for your beautiful Christmas greeting to all of us! Diane S. - So sweet of you to stop by...glad you enjoy. Gardenia - Yes, you are absolutely correct. It is a shepherd's hat. See below for a link to check it out. Anonymous - I wish you had a name...I'd give you a hug for making me laugh out loud. I'm not even a member of the "Red Hat Society" (old ladies wearing red hats...but I am old anyway). So glad you like the Christmas message. Now, here is a link to see the hat. Micki, I really enjoyed the beauty of this e-card. Reminded me of the Christmas trees and decorations of Germany when I was a child. Thank you for sharing this. Also the card posted for today is very sweet. I am prayig for all as we prepare for the day of Jesus' arrival that we may love Him more this Christmas than we did last year. May Jesus be born anew in our hearts this Holy Season. As the wisemen of old brought gifts of gold franinsense and myrr, let us give the Christ Child the gift of our hearts and life!! Have a Peaceful weekend Micki~ John K.
John K. - Thank you from "all of us" for your prayers. I love your message to "give the Christ Child the gift of our hearts". Very appropriate.